The Index opened huge up around 8131 and stayed positive throughout the entire session of trade and closed just a few points below the psychological level of 8200 at 8191.50, huge gain of 134.20 points. The broader market was also strong, with just 1159 advances to 350 declines. Developing Range as per Option Table is 8000-8600. 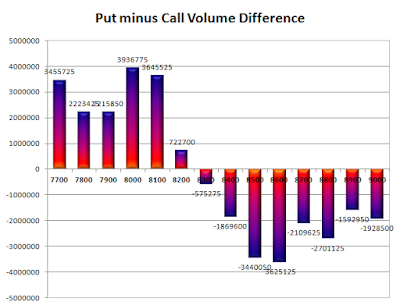 Call option 8300, 8500-8600 added 8.16 lacs OI with short covering seen at 8200 and below strike price. Put option 8200-8000, 7700 added huge 19.68 lacs OI with short covering seen at 8400 and above strike prices. 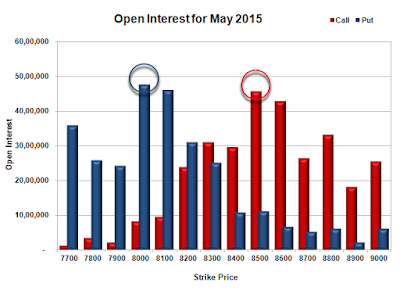 Nifty Open Interest is at 1,36,63,525 down by 12,61,950, with increase in price, most probably huge short covering. 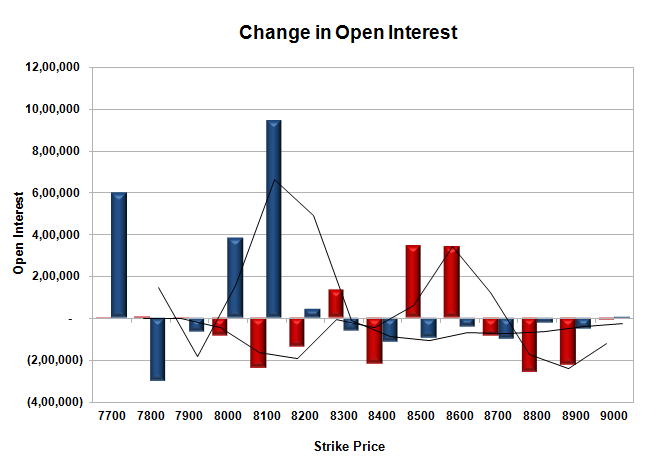 Bank Nifty Open Interest is at 18,09,150 down by 2,77,925, with increase in price, most probably huge-short covering. FII’s bought 1.75 lacs Futures, which includes 5882 contracts long liquidation and 12897 contracts short covering, with decrease in net OI by 18779 contracts (includes 96346 longs to 89331 shorts for the day) and the Average Price comes to 8960.60. 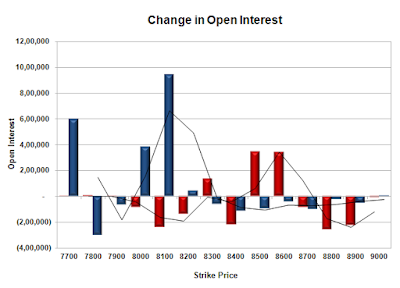 FII’s Index future open contract as on date is 226372 Longs to 199122 Shorts, net long just 27250 up 7015 contracts. Initial support now at 8200, with OI of 31.12 lacs and below that at 8100 with OI of 45.97 lacs. Initial resistance at 8300, with OI of 30.96 lacs and above that at 8500 with OI of 45.63 lacs. Day Range as per Option Table is 8083 - 8286 and as per VIX is 8110 - 8273 with 8180 as the Pivot.